While two games do give us more information to evaluate players with, it is still way too early to reach for the panic button. Yes. There are quite a few big-name, proven IDP producers who have started slowly — Chandler Jones, Everson Griffen, Telvin Smith, and Landon Collins are a few names that come to mind. Do not bench any of the aforementioned. Water always finds its level, and these are top-tier NFL/fantasy players. Let’s give it one or two more weeks before making drastic moves. As Aaron Rodgers once said, “R-E-L-A-X.” There will be plenty of time to panic later in the season. Let’s take a look at some Week 3 IDP start/sit suggestions. The veteran Casey has come out of the gate hot, posting 11 total tackles, two sacks, and a forced fumble in the first two games. The tackle numbers should continue to be there this week against a Jaguars offense that has given up 36 total tackles to the defensive line position. Jacksonville has been a bit stingy in the early going as far as giving up sacks to DL having allowed just half a sack to date. However, Casey did manage to post a sack and six tackles against the Jaguars last season. Look for Casey’s hot start to continue in Week 3. My esteemed colleague Ross Miles touched on Ogunjobi as a waiver pickup this week and I’m taking it a step further suggesting we get him in our IDP starting lineups. The Browns placed enough faith in the second-year defensive lineman to trade Danny Shelton to the Patriots. Ogunjobi has responded with 11 total tackles and three sacks through the first two weeks. Thursday night he faces a Jets offensive line that allowed three sacks to defensive linemen in Week 2. It’s been a solid start to the season for Hicks as he’s put up six total tackles with a sack and forced fumble. It’s the matchup with the struggling Arizona offense that concerns me. The Cardinals offense simply isn’t on the field enough for defenders to amass fantasy production. Arizona is last in the league in offensive snaps averaging less than 50 per game. Opposing defensive linemen have totaled just 16 tackles through the first two games with one sack and a forced fumble. There are a couple of factors at play when evaluating Flowers heading into Week 3. First and foremost is that Flowers needs to clear the leagues concussion protocol to even hit the field Sunday night. Secondly, with the Lions struggling out of the gate and an angry Patriots team coming off a loss this game could get out of hand early allowing the Patriots to rest Flowers. One final note to consider is that the Lions have allowed just one sack to a defensive lineman in their first two games. The rookie Leonard is the real deal and getting it done in all facets of the defense. Leonard was named AFC Defensive Player of the Week after posting 18 total tackles along with a sack, forced fumble, and batted pass in the Week 2 win over the Redskins. This week Leonard lines up against a Philadelphia offense that has given up 36 total tackles to linebackers along with a sack and interception. Look for the top-scoring fantasy linebacker through the first two weeks to keep on rolling in Week 3. With the news that Alonso will not be suspended for his hit on Joe Flacco last week, the veteran is a must-start this week against Oakland. 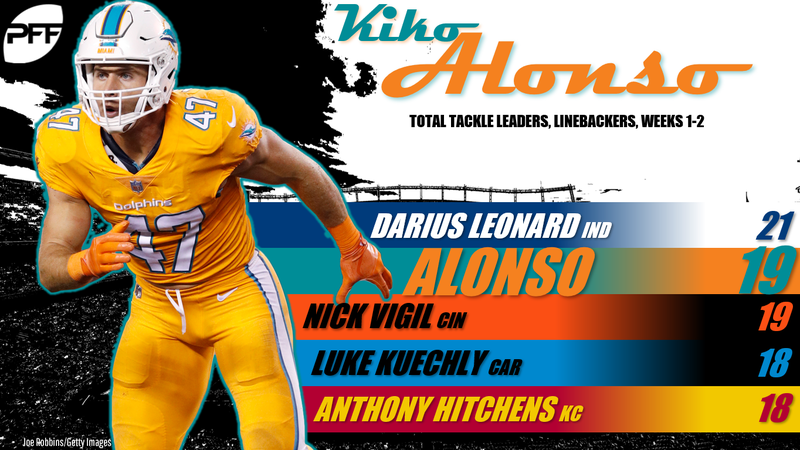 Alonso is on pace to easily surpass his career high in solo tackles (87 in 2013) having put up 19 in the first two games. Ironically, he has yet to be credited with an assisted tackle. Alonso is also getting it done on the big play side of things with an interception and two forced fumbles. A quick glance at this matchup would lead one to believe that Lee should have a productive week, as the Seahawks have allowed 39 solo tackles and three forced fumbles to opposing linebackers. Where the worry sets in is that Lee has not looked like himself through the first two weeks. Having played 102 of a possible 136 defensive snaps (he left Week 2 in the fourth quarter due to cramps), Lee has managed just nine total tackles. More concerning is that he has missed five tackles and looks a step slow. With rookie Leighton Vander Esch notching seven solo tackles while playing just 28 snaps last week and Jaylon Smith finally healthy (Smith has 14 total tackles and a sack) it may not be long until Lee finds himself in a backup role. This one will be short and sweet. Veteran Gerald Hodges started last week ahead of Bucannon, who was relegated to a subpackage role and played just 25 snaps. There’s no reason to consider starting a part-time linebacker. The Ravens have been a nice matchup for defensive backs as they have given up 57 total tackles, two interceptions, and two forced fumbles to the position. Simmons has played every defensive snap for the Broncos and is coming off a nine-total-tackle performance against the Raiders. Simmons also brings big-play potential to the safety position having posted an interception in Week 1. This is a good week to roll with Simmons. It’s a little stunning that the veteran Bethea is leading the Cardinals in tackles through the first two weeks in his 13th NFL season. A closer look at where Bethea has been lining up sheds a bit of light on he’s racked up 18 total tackles to date. Bethea has lined up along the defensive line or in the box on 81 of the 149 defensive snaps he’s played. Basically, Bethea has been a linebacker over 53 percent of his time on the field. IDP owners should ride Bethea this week against the Bears. Heading into Week 1, Edmunds supplanted Morgan Burnett as the starting strong safety for the Steelers and he played 74 snaps. Unfortunately, Edmunds failed to register a single tackle against the Browns in that game. Last week, Burnett drew the start and played 90 percent of the snaps while Edmunds played just 32. It appears we will need to wait a little while to see if Edmunds receives another starting opportunity. When the Saints allowed Kenny Vaccaro to walk in free agency many pundits (including myself) believed this would lead to a bigger roll for Bell. This has not been the case through the first two weeks of the season. Bell has played just 55.1 percent of the defensive snaps and has just nine total tackles. Even more concerning is that Bell has lined up in the box or on the defensive line on just 40 percent of the snaps. It’s time to look elsewhere for defensive back purposes.